Let’s Talk: How Is Your Child’s Speech and Language? 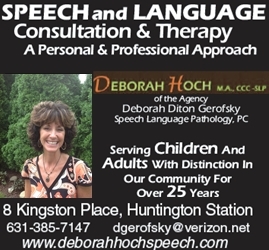 Deborah Hoch, MA, CCC-SLP is a speech pathologist with a practice in South Huntington. We all want our children to grow up to be good communicators, but what does that mean? What we are really saying is that we want our children to be able to express themselves, to engage in appropriate conversation, to explain how they are feeling and why, to tell us about things that have happened and to be develop positive social relationships. We want our children to be able to speak clearly so they are understood by their family, friends, teachers and others in the community. We want our children to learn to be good listeners, speaking “with” people and not “at” them and to respond appropriately to what they hear. The first years of a child’s life provide the foundation for what kind of communicator your child will be. If you recognize any of the above behaviors in your child’s speech and/or language, you should contact a speech-language pathologist to discuss your concerns. If help is needed, the speech-language pathologist will recommend an individual program of activities to help your child and provide therapy if it is appropriate. Remember, we want to help our children to be the best that they can be!